Suction assisted lipectomy or liposuction is one of the most popular means of body contouring techniques in cosmetic surgeries. A number of important modifications to the standard suction assisted liposuction including UAL (ultrasound assisted liposuction), PAL (power assisted liposuction), VASER and laser assisted liposuction are available today. Liposuction treatment is being used for Multiple Lipomas nowadays. The Multiple Lipomas is the excessive growth of fat cells most commonly around the neck, armpits, upper arms, torso, upper thighs. Prior to liposuction, a pre-operative marking is done with the patient in an erect position. In patients undergoing total body liposuction or contouring, marking can be done one day prior. Areas to be suctioned are marked with a circle. Incisions are placed in hidden areas and are approximately 3mm to 4mm in length. For all those people who are planning to get this done, the procedure begins with a consultation. The primitive and long term success of every cosmetic surgery begins with the right consultation offered by the plastic surgeon. In the consultation process, five important questions are extremely necessary to be asked by you. 1. HOW MANY TIMES A MONTH DOES THE DOCTOR PERFORM THE LIPOSUCTION PROCEDURE? Liposuction is one of the most known and popular surgical procedures around the world. It is not abnormal to expect that all plastic surgeons have fairly a good experience in performing liposuction. However, in reality it may or may not be true. Sometimes, you fall in a trap of a wrong cosmetic surgeon who doesn’t really know well about the procedure and has not really treated all body types in men and women. Also check on the qualification of the plastic surgeon before taking a step ahead. Before moving ahead, it’s extremely important to know how the procedure will be performed and what are the possible risks and complications involved in the surgery. Types Of Anesthesia: Small volume liposuction can be done under local anesthesia with mild sedation. Large volume liposuctions require general anesthesia. The procedure involves injecting an-aesthetic solutions into the body to facilitate fat removal and decrease post op pain. Special cannulas are used to aspirate the fat from the problem areas via small incisions. Though the process is considered to be safe, however sometimes there is a chance of dizziness, swelling, infection or a blood clot post surgery. 3. THE TOTAL COSTS OF THE PROCEDURE? The cost should never be the only considerable decision while planning a liposuction surgery. This is because it’s important to look for the best of what you can and to attain the optimum results. However, before getting the surgery done, do a complete due diligence in checking what is being offered at various clinics considering the experience of the doctor. Also be extremely careful about any quote that is too alluring to really be true. 4. WHAT IS THE POST OPERATIVE CARE AND HOW MUCH TIME WILL IT TAKE TO RECOVER? Patients require a compression garment which is customized as per area. Patients can be discharged on the same day and can return to normal activities within a few days. Light exercises are allowed after a couple of weeks. Post operative swelling and bruising occur and subsides over a period of fortnight. Final aesthetic result will be visible in the following months. This of course is not the complete list of what needs to be asked before getting a liposuction done. However there may be a lot many things that need to be discussed with the doctor before moving ahead with the surgery. If you are thinking of undergoing a liposuction surgery, you may come and visit Aestiva – Dr Mrinalini Sharma’s well known cosmetic surgery clinic in Delhi. 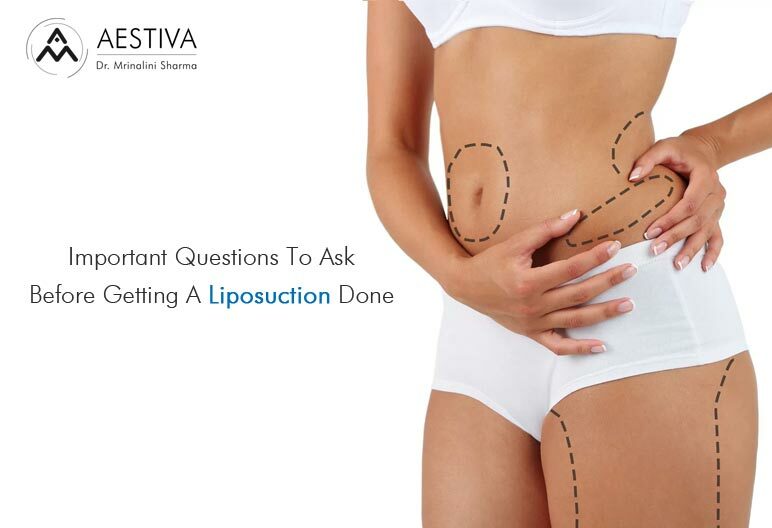 In order to acquire more information about liposuction and other treatments offered at Aestiva Clinic, send us an email at info@aestivaclinic.com.